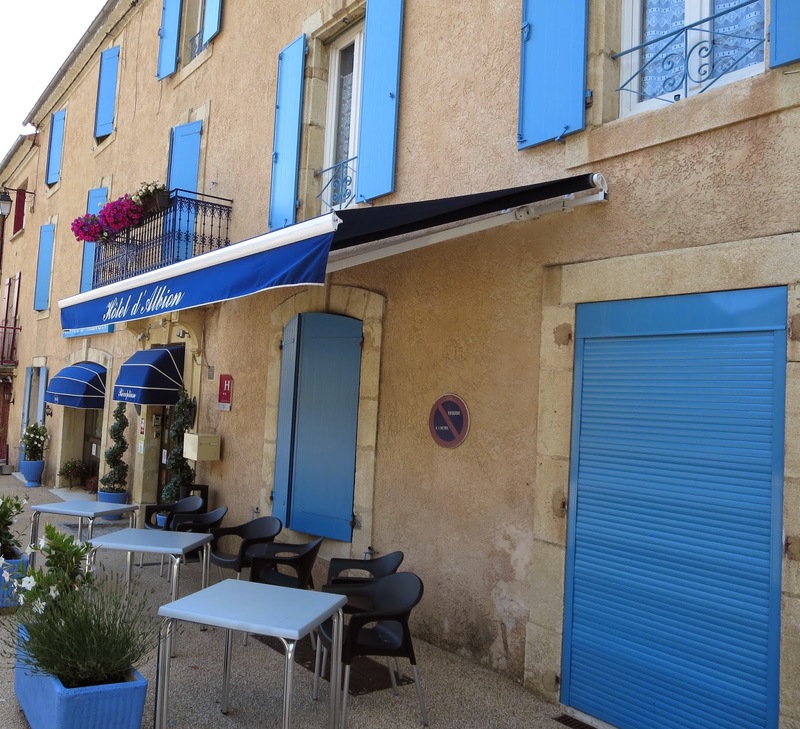 In our three weeks of riding in France this summer one area we knew for certain we’d be headed for was Provence, specifically the Vaucluse region. 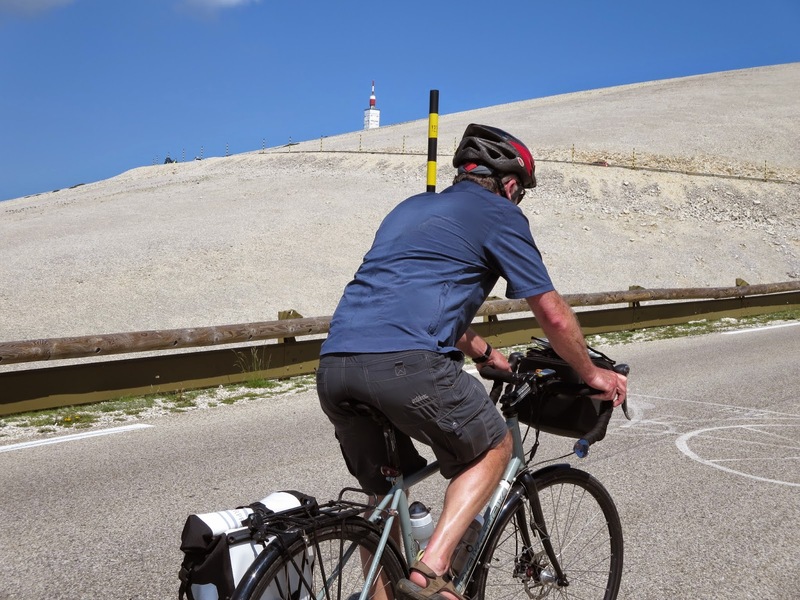 It’s famous for it’s lavender fields (as an Aromatherapist this was a priority for me to see) and for Mont Ventoux. 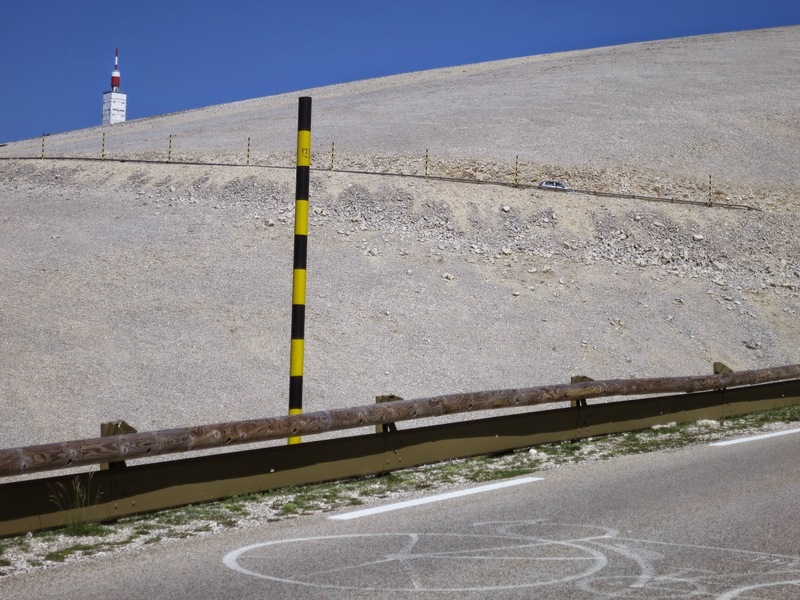 Not the biggest mountain to ride up but one that has taxed many a rider of the Tour de France. We’d talked it over with friends before we left on the trip. There’s an ‘easy’ side and two ‘harder’ sides. Well, no guesses for which approach we decided on! 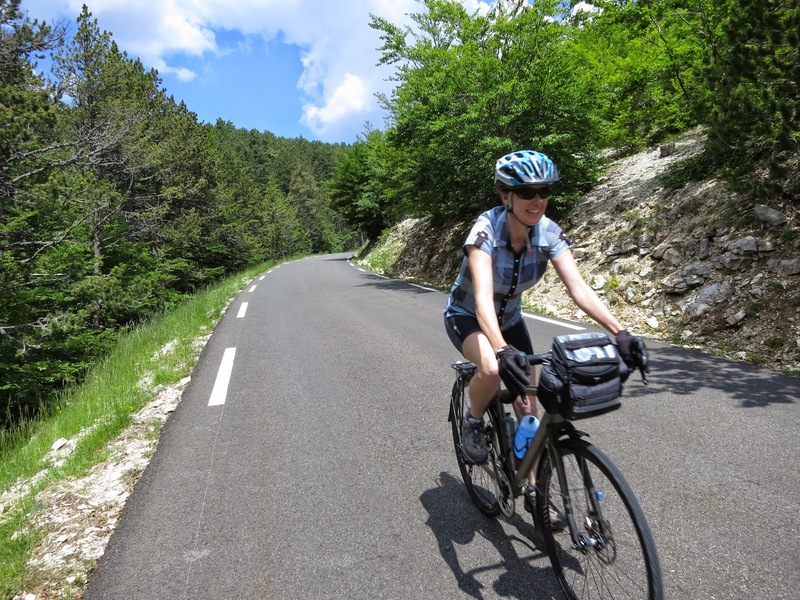 As a first time cycle tourer I needed all the help I could get. ‘Course, we would happen to be there in the midst of a heatwave, in early June. The day we decided to head out from our hotel in Sault the temperature was expected to reach 36c. What to do? We only had a couple of nights left in town. 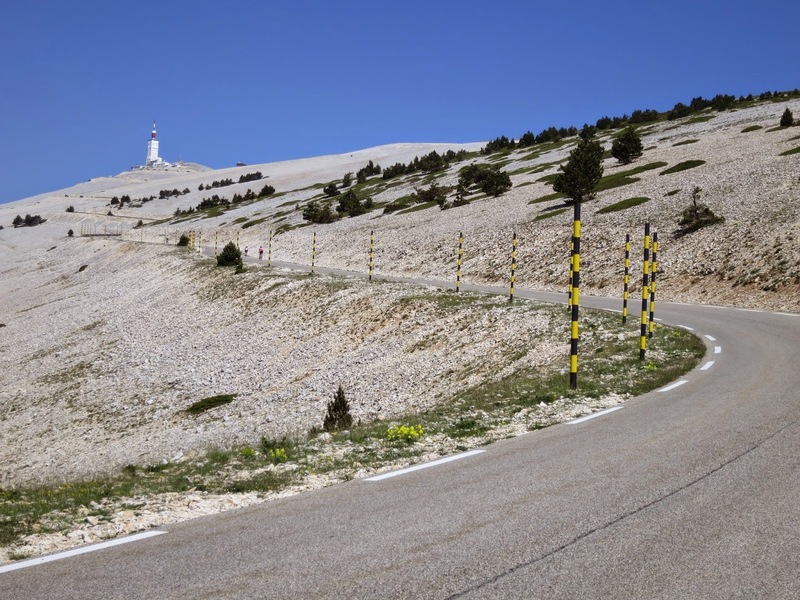 We knew we’d need a day to have a more leisurely ride after Mont Ventoux and then we’d be leaving for our next destination. There was no question of not trying to ride the mountain, although I did suggest we could always ‘go and have a look’ and back out if we didn’t feel like it without giving ourselves too much of a hard time. The couple who run the hotel we were staying in in Sault, Jean-Luc and Patricia, were great and used to riders. Actually, they were completely booked that weekend with cycling groups. I think everyone figured they’d had the weather beat by booking at this time of year and all had been caught out. For our hosts it must have been like watching hordes of locusts eat their way through fields of yoghurt, bread rolls, croissant, jam, butter, orange juice, cold cuts, cheese, cake! (great energy boost), coffee, water, water, water. And then start over. The welcoming Hotel d’Albion. That’s a garage for bikes on the right! 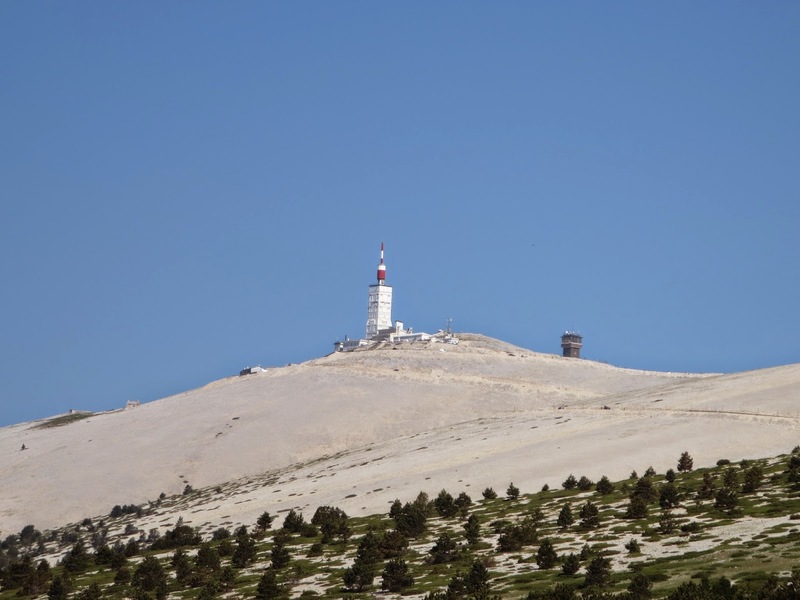 From Sault it’s a relatively short ride to the Mont Ventoux, 26km in all. The first 20km was gorgeous, forested, shady, and so quiet. It felt easy, even if the heat was beginning to build. As were the numbers of riders and, surprisingly, speeding drivers. 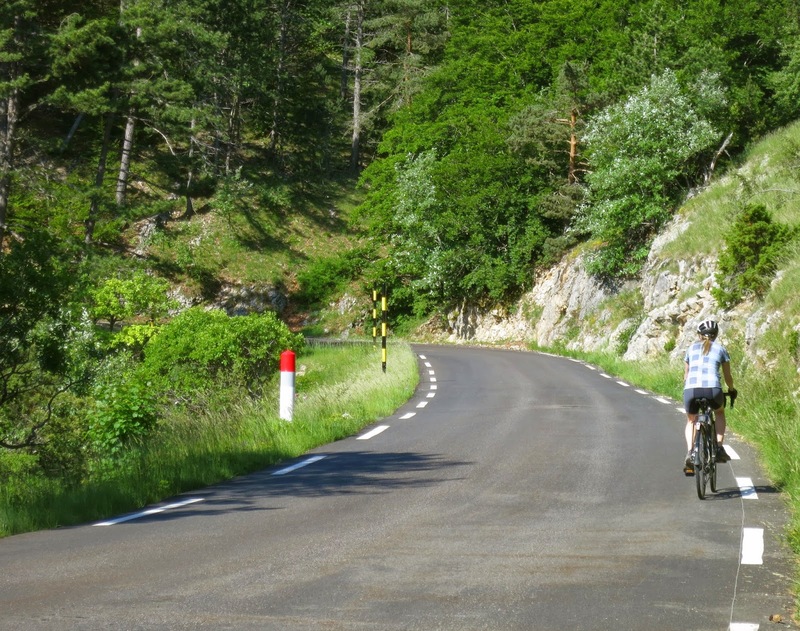 Apart from a couple of notable areas French drivers are very respectful of cyclists, making a point of slowing down and giving you a lot of room. Quite suddenly however, we rounded a corner for the last 6km and it was as if we hit a wall. The famous ‘moonscape’ view of the mountain hove into our sights. The road angled around and up, cutting through the rock that gives the mountain top the famous snowcapped look. Supporters of a local bike race that day were throwing buckets of iced water over the heads of the competitors, photographers took photos as riders toiled past and ran after them to tuck business cards in the back pockets of cycle jerseys. ‘Bonne chance!’ was yelled at us as we rode past. Mon Dieu! Did we need good luck? Why?! We soon found out. It was intensely hot as we started to toil up the last few kilometers and I couldn’t seem to drink enough water. And my legs! They would just stop revolving after a couple of corners, irrespective of whether I wanted them to keep going or not. I honestly didn’t think I would be able to reach the top, but when you have the summit in your sights, and more importantly when it seems everyone else is going to get there (there were multitudes of cyclists in various states of pain toiling their way up), it just doesn’t seem right to not at least give it your best try. We fell into a rhythm of ride, stop, gulp air and water, repeat. As we got closer to the top, the air temperature dropped dramatically – a real lifesaver. I have to admit as we rounded the last, and very steep, corner, I was thrilled. You really don’t know what you can do until you try, sometimes you just have to pull on that stubbornness and let it do the work. We milled around with hundreds (so this is where they all were, after all those quiet country roads we’d been on) of other cyclists for a while. Downed sandwiches, drinks and chocolate and a little reluctantly headed down for a fast and furious ride back to town and a well deserved wine and beer. Fabulous!